When you live in the sprawling urban landscape that is Southern California, you can develop a rather confused relationship to nature. We may yearn for the natural world but when it comes around on its own terms, we can get pretty cranky. Just ask any of the San Gabriel Valley residents who suffer the rude awakening of hundreds of shrieking, screaming, squawking wild red-crowned parrots. Fun fact: A group of parrots is called a "pandemonium," which is actually the perfect description for how crazy — and crazy-making — these birds can be. Prepare your ears (and we suggest headphones if you're at work right now) for the video below. 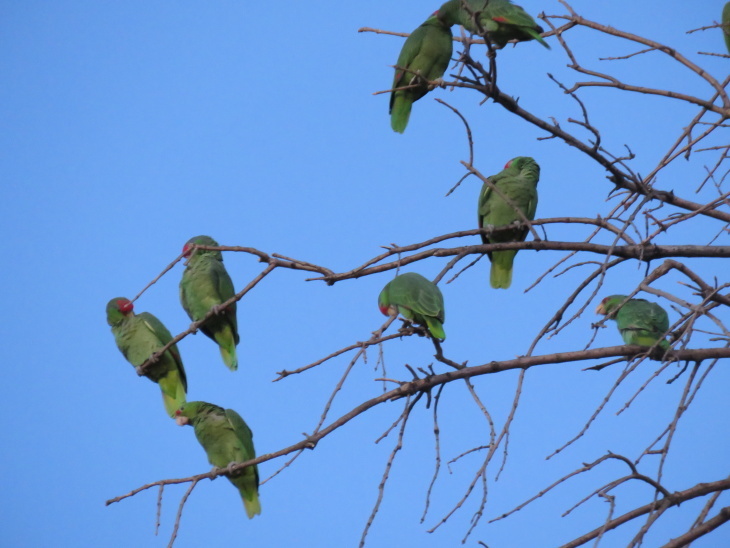 Pasadena's red-crowned parrots are nature's annoying alarm clocks. They may also be the best hope for their species. 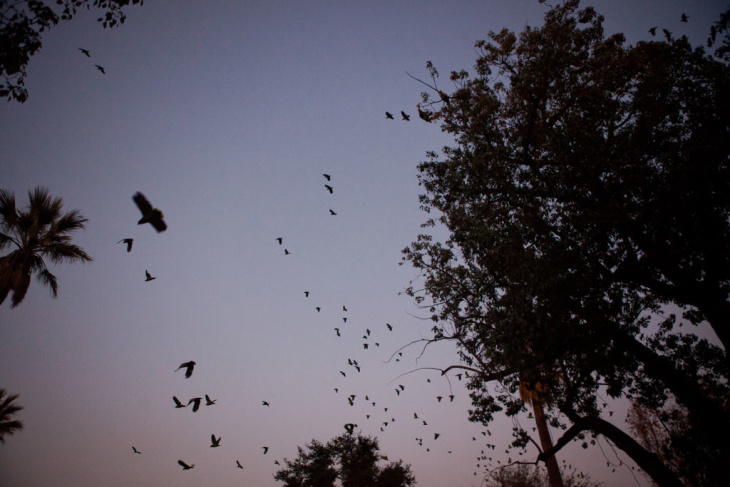 We explored how the super loud birds made their home in San Gabriel Valley. Locals living near parrot nests get to enjoy the jarring choir parrots at dawn and dusk. Every. Single. Day. Even on your day off (speaking from experience). Many San Gabriel Valley residents squawk back on social media. Every year, San Gabriel Valley is temporay home to a bunch of ferral #parrots . This couple in the pic is hanging out in our neighborhood. As nature's brash flock of unwanted alarm clocks, the red-crowns are rough on the ears — but a vision to behold. 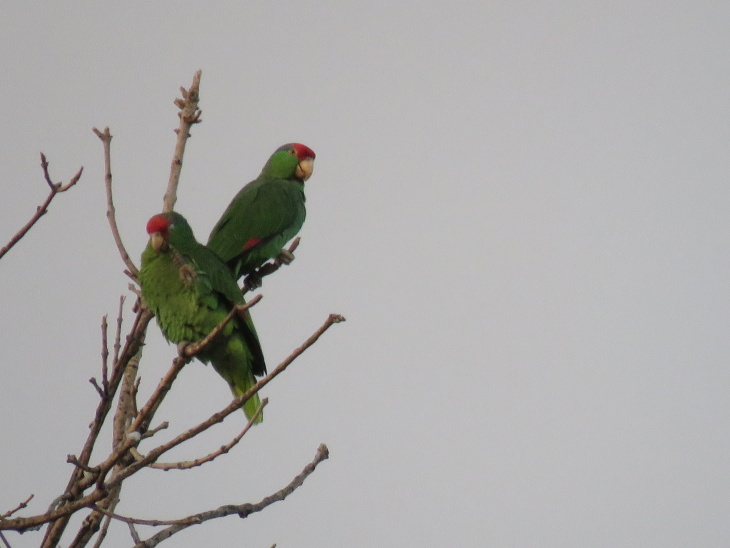 When you can get a good look, you can see their bright, green feathers and the patch of red ones adorning their heads, earning them their common name. And while residents may bemoan the parrot's noisey nature and penchant for inconvenient pooping, many appreciate having the exotic wildlife around. And they certainly capture the fancy of local photographers. The red-crowns aren't the only wild parrots in Southern California. Their equally colorful cousins can been spotted all over Los Angeles. But as annoying as they may be, we're actually pretty lucky to spot this particular species, because they're endangered in their native habitat in northeastern Mexico. So if these parrots aren't native, how did we get so many of them? Urban legends tell of epic pet store fires and hoards of parrots making a narrow escape to freedom. These tales range in decade and city where the alleged blaze took place but after looking into stories, experts simply can't find evidence that supports the pet-store-fire-theory. Yes, the red-crowns were brought to Southern California through the pet trade but there isn't one event of an en masse parrot release. Instead, it was a steady flow of individual escapees that laid the foundation for the current population. The flocks you see dashing around Southern California skies are the descendants of individual pet parrots that escaped and found one another in the wild. "One way or another, a sufficient number of these parrots got out in the '70s and '80s," said Ursula Heise, chair of the Institute of the Environment and Sustainability at UCLA. She produced a short documentary called Urban Ark, profiling the local red crown's inspiring story. Heise said it's "pretty amazing" the parrots were able to adapt enough to survive in the region. What went wrong with the red-crowned parrots' native habitat? The very trend that brought scores of parrots to SoCal decades ago is in part responsible for their dwindling numbers in Mexico. Poachers exported parrots by the tens of thousands and deforestation decimated their habitat. Mexico retains somewhere between 3,000 and 10,000 red-crown parrots, so the fact that there are an estimated 3,000 in L.A. County got biologists thinking — maybe the red-crowns should become a model for preservation. The theory springing up suggests that the local red-crowns may serve as a bank or back-up stock for their entire species. But the idea of fostering an endangered population outside of its original habitat is a somewhat new approach to preservation. It may buck some ecologic tradition, but proponents contend a new home is better than no home at all. Over the years, San Gabriel Valley residents have planted all kinds of fruit and nut trees and the parrots are happy to chow down. Plus the region's old buildings provide plenty of shade and places to nest. The local satellite colony of red-crowns has transformed the area into a kind of Noah's Ark for the endangered species, thus the name of Heise's documentary. "How can we make L.A. hospitable both for people who need a home and for species that need a home?" Heise said. "And that's regardless of whether they are originally from here or whether they are not. "How do we make our buildings, parks, bridges, habitat for non-human species as well as useful and aesthetically pleasurable for ourselves?" Fan or not, the wild parrots of Pasadena (and the greater SGV) could save their species from extinction and that's impressive. So for those of you yet to make peace with the daily pandemonium in the trees outside your home, maybe grab a Costco-sized box of earplugs and settle in. You made it! Congrats, you read the entire story, you gorgeous human. This story was made possible by generous people like you. Independent, local journalism costs $$$$. And now that LAist is part of KPCC, we rely on that support. So if you aren't already, be one of us! Help us help you live your best life in Southern California. Donate now.